Complete systems for surgical assistance, image-guided surgery, and what I refer to as "Surgical CAD/CAM". An underlying theme has been the basic insight that information-based technologies can have just as profound an impact on computer-integrated medicine as it has had on computer-integrated manufacturing. Some of my current and recent research projects include work on systems, medical robotics for microsurgery and MIS, statistical modeling and deformable 2D-3D registration, radiation oncology planning, and human-machine cooperative systems in surgery. 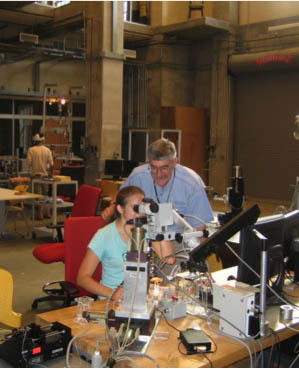 More information may be found on the Research Page of this web site and on the web site for the Computer-Integrated Interventional Systems Lab. Information about my early medical robotics work at IBM can be found by following this link. Information about my other earlier work can be found by following this link. You can find a (somewhat complete) list of my publications in my curriculum vita. An extended (2 page) bio-sketch can be found here, and a shorter version can be found here on my faculty page on the CS Department website. The Computer Science Department has recently changed the numbers of this coruse from 600.445/645 to 610.455/655. There will also be changes in the CIS II course numbers. Further changes to this and the CIS II web site will be made as soon as I can get the new numbers clarified. Click here for an annotated campus map showing how to find my office and other locations on campus.